So, we thought it might be interesting to post a quick synopsis of our first 80 days on the road, to capture how we’re getting on to date. As I’m sure was the same for Mr Fogg, some days it feels like we’ve been on the move for a lot longer than we have, other days it’s like we’ve barely started and have only scratched the surface of our visiting potential. Our days are still jam-packed with interests and activities, but time is still marching by much faster than we’d like. 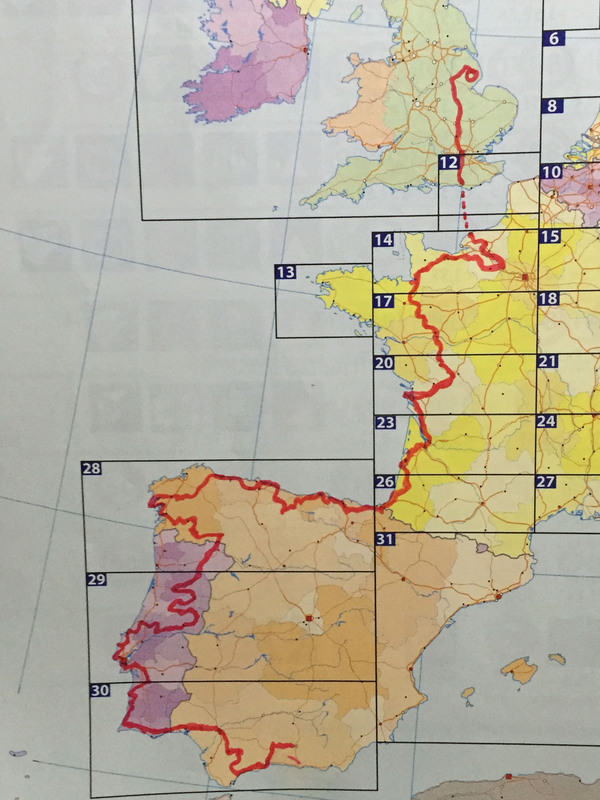 Here’s a rough approximation of our route so far; beginning in Lincolnshire, then heading first down the west coast of France, across northern Spain, into Portugal and zigzagging south until we reached the Algarve, then east back into southern Spain. We’re currently in Granada as we post this update, on day 80 of our trip. We’re tracking every penny spent whilst away on the road, because we want to see if it’s a fully sustainable way of life for us. We can then compare what we spend our money on and track if our outgoings in specific areas need to be tweaked. Also, because I’m a bit of a statistics geek and like to play with our growing spreadsheets to see what conclusions can be formed from the information gathered, all manner of comparisons of costs across months and countries can be made. So far we have spent less than our initial projected budget; Portugal has been the cheapest country to date, with 31 days of travelling there with an average spend of just over €25 per day. This was over 35% below our original budget projections, so we are proving to be more frugal on the road than our starting expectations. This is definitely a good thing as it allows us a surplus for unseen surprises and unexpected costs if and when they occur. Unsurprisingly, food and provisions brought from supermarkets is our highest cost item, run close with diesel for Benny. The percentage spend on diesel will no doubt diminish over the coming months as we covered a lot of miles in France in a hurry, and our pace of moving on since then has dropped significantly. – Realised that Portuguese, whilst looking similar to Spanish, in no way sounds like it is written when spoken. But also, we’ve found that a lot of Portuguese people speak decent French (but not Spanish), so that’s been helpful. Shopping for food is much the same as at home, with the exception of cheeses, which are sometimes silly expensive and often awful. We’ve recently found that Lidl stores are the more dependable in terms of cheese supply, and do often stock cheddar, salad cheeses and feta for sensible prices, so we stock up there where we can. We recently bought a litre of red wine for €0.69, another litre for €0.89 and a third, this one a premium label, for €1.10. We thought it best to try each of the available levels, to see which is better, or at least our favourite. That’s three litres of red wine for €2.68, or as that volume equates to four standard 750ml bottles, a cost of €0.67 each. That is, at the time of writing, a whopping average bottle cost of 57p. This immediately makes us wonder at both the quality of this product, but also the level of mark-up included on a standard bottle of wine available at home. The first litre was rather poor; it was 10%, but looked and tasted less, more like a red that had been cut with water to dilute it for volume, with no expectation of taste. To be fair, we weren’t expecting much, and got exactly what we paid for. The second was actually a lot better, a 12% deep, fruity red that was reasonably tasty and went down very nicely. The third, the premium label, was quite different, sharp and bitter, and neither of us were left impressed. So, we found our ‘everyday’ wine – a €0.89 per litre red from Don Simon (or occasionally Peñasol). This certainly keeps our costs down, as now our favourite (cheap) biscuits cost more than a bottle of red. It’s also become a joking marker for any other expenses we have; a €3.50 parking charge now gets equated to 4 litres of wine – is it worth it? Doing €8 worth of laundry – are you mad, that’s 9 litres of wine, or 12 bottles! We do occasionally treat ourselves to a posh bottle costing around €3, because, hey, life’s too short. 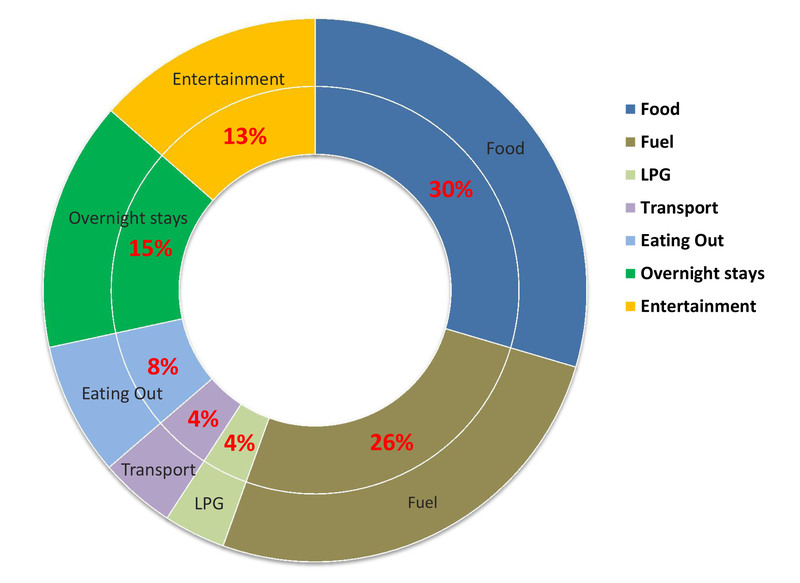 This changes a little on a daily basis, but the general theme that feeding ourselves is the biggest expense, followed by fuel for travel, with every other expense lagging behind, is reasonably constant. As we’re spending a fairly low amount (around €250 / month) on food, this really puts the cost of this lifestyle into perspective. Other than eating out more, and we love to cook so this is not too much of a hardship, we don’t deny ourselves much at all. In short, all is going well and looking sustainable going forward. We’re comfortable with our pace, our spending and our level of activity. We really need to be running under budget for this portion of our trip, as we will be splashing out for a few weeks of skiing in the French Alps come February, and that doesn’t come cheap. We do sometimes feel that, even though we have all this time to ourselves and few other external commitments, we don’t quite seem to be achieving all that we’d hoped for in the free time we have. We’re visiting places and learning their history, reading books, enjoying beaches, cycling routes and trekking mountains, but these are all the expected activities of our trip. The mundane, everyday things; shopping, cooking, laundry, servicing for Benny (e.g. Emptying waste tanks, filling up with drinking water etc..) all take up a greater portion of our time than we thought they would, and we don’t seem to be able to fit in enough of the luxury extras – playing guitar, writing for pleasure, sketching, learning languages. Or, it could be that we are falling into the lazy ways of the recently unemployed and time-rich and making the typical excuse of “we’ll have time for all that tomorrow”. We hope it’s not the latter and that we make the effort and recommit to achieving the goals we aimed for at the outset of our journey. It’s only 105 days now until our first return to the UK, six months into our trip. This entry was posted in Finances, Other Musings on Nov 23, 2016 by Aaron Hill. finding this blog fascinating. It’s a slow read for me – but I have book marked it and dip in now and then. This entry on expenses was a real eye-opener. I thought it would cost a lot more, but broken down to $25 euros a day makes this about $9,200 euro a year – I could do that. We intend stating Easter 2020.